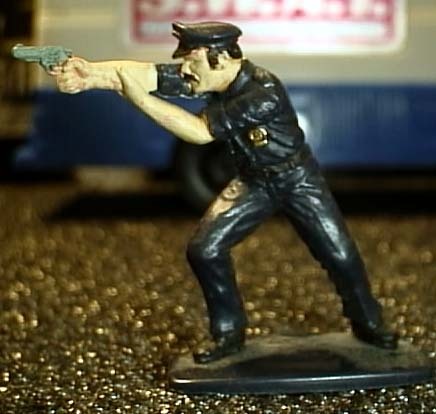 A couple of years ago, PPC/Timmee ran these 45mm cop figures...while they aren't the best figures in the world, they are something different. 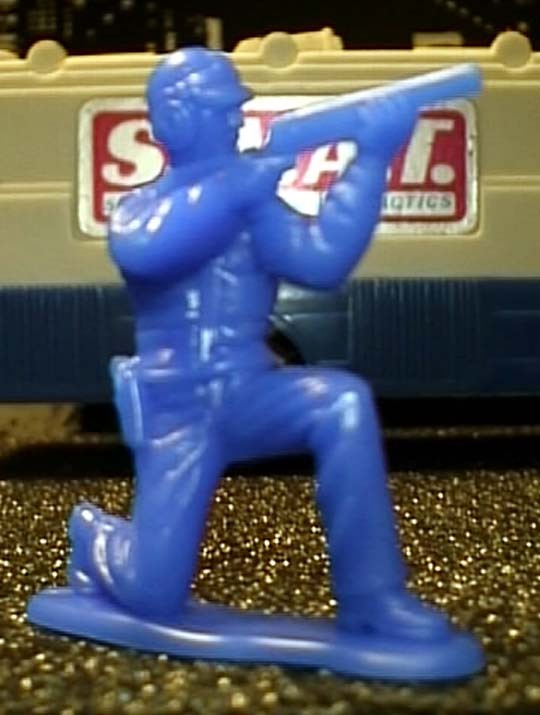 These guys were offered with a BIG helicopter, kind of an Apache with pilot figure. 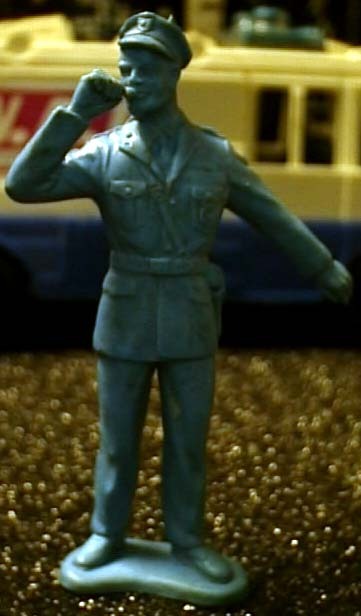 The chopper was scaled for 3.75 inch figures. 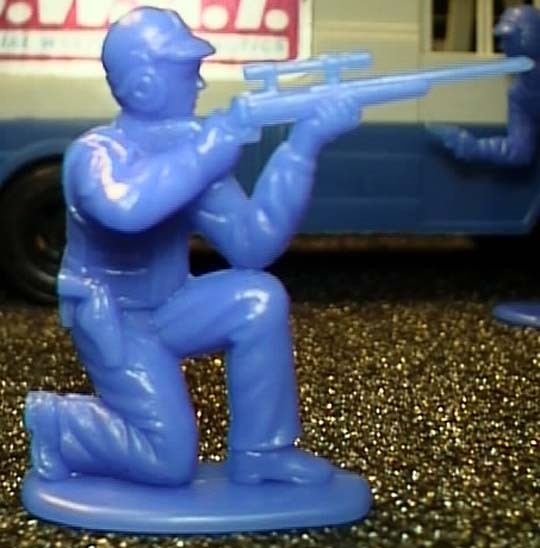 Oh well...here they are. 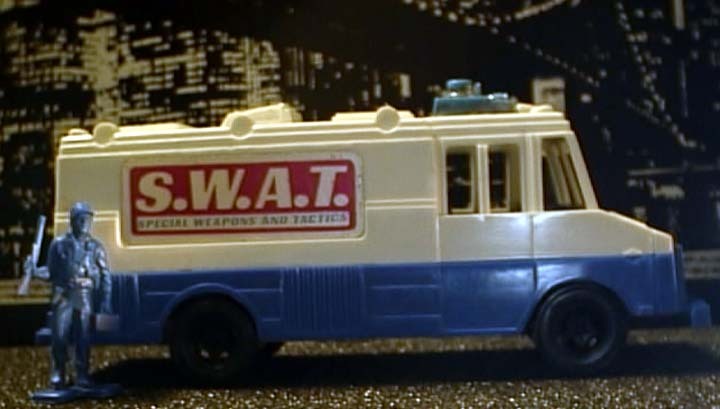 Matchbox did some larger scale vehicles that came with figures. 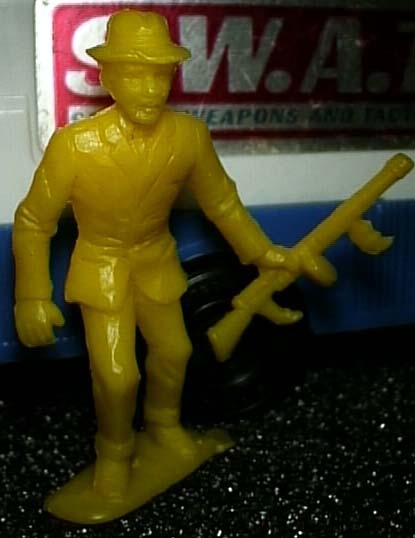 The scale is around 40mm or so. 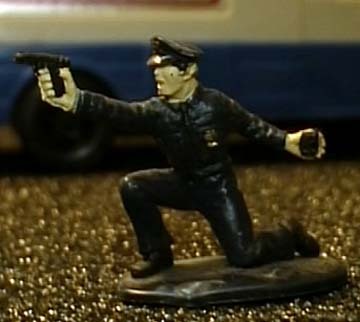 I think the kneeling guy is supposed to be next to the squad car. 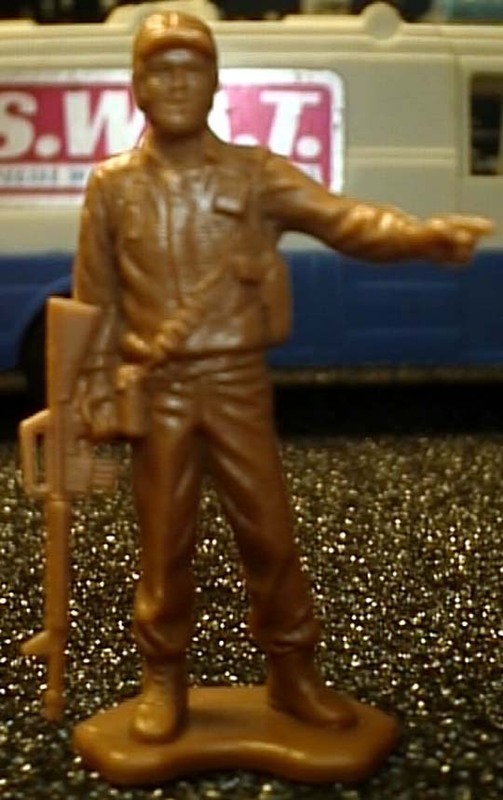 If you look close you will see that I had to graft a hand off of a scaled-down copy of a 54mm Matchbox WW2 soldier as mine was missing. 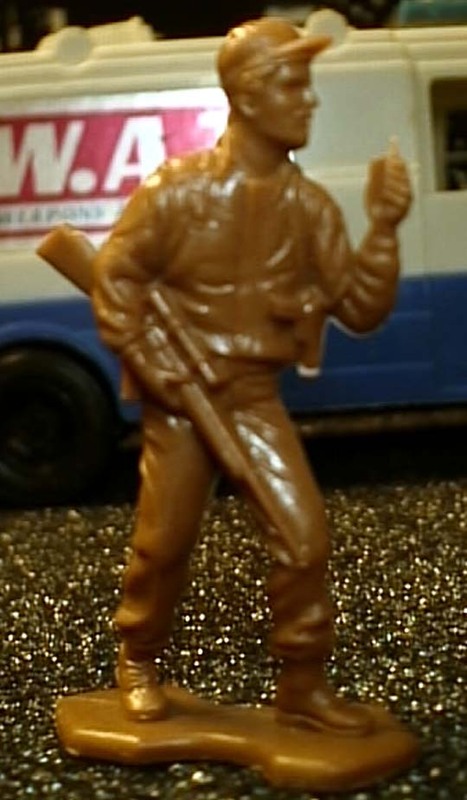 On the bottom, a scaled-down copy of an Airfix Desert Rat officer with his canteen shaved and his pants legs filled in. 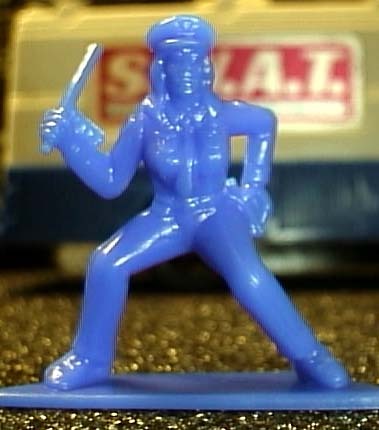 After posting him, I see he needs to be worked on some...I will see what I can do. 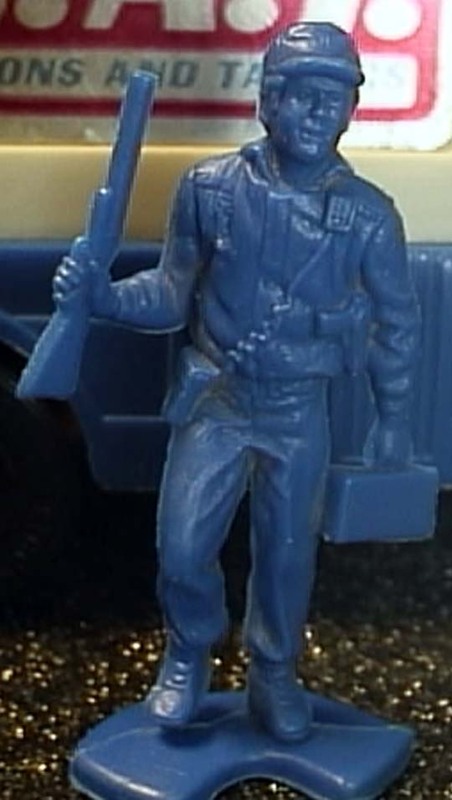 The Timmee company was prolific in making toy figures. 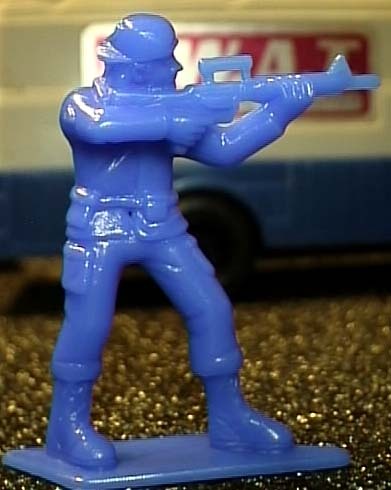 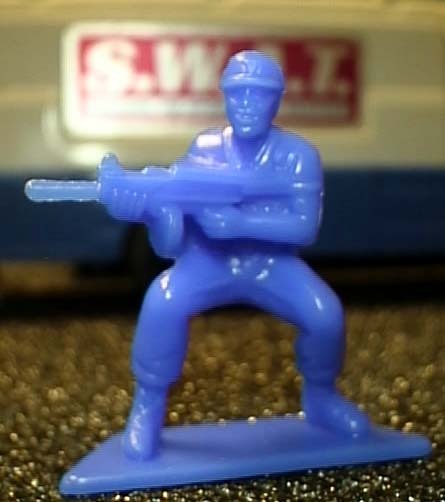 The 60mm range of police figures are some of my favorite. 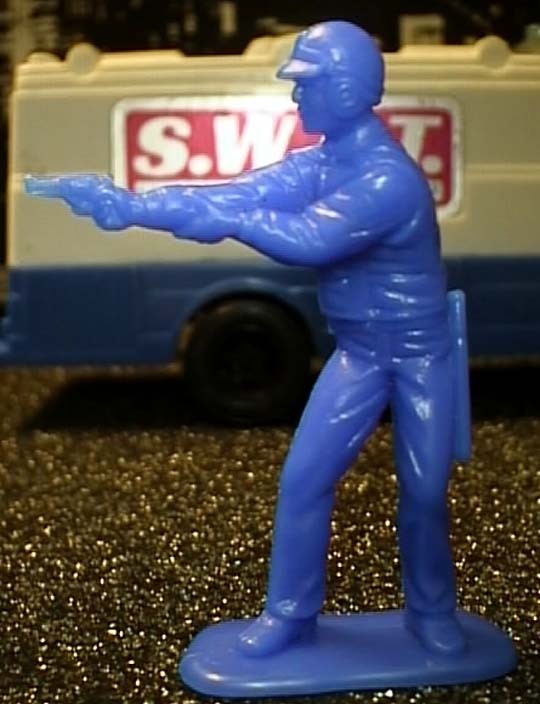 Outfitted in the equipment of tactical cops of the late 60's-early 70's(when SWAT teams were beginning to form), these figures are true art. 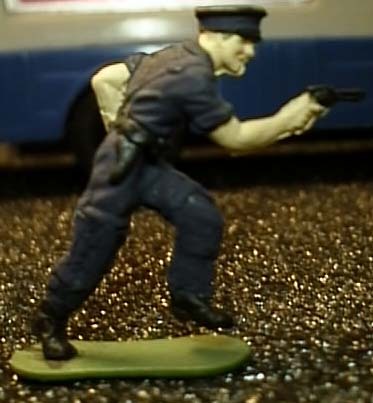 Even the firing stance is right out of the old cop manuals and TV shows. 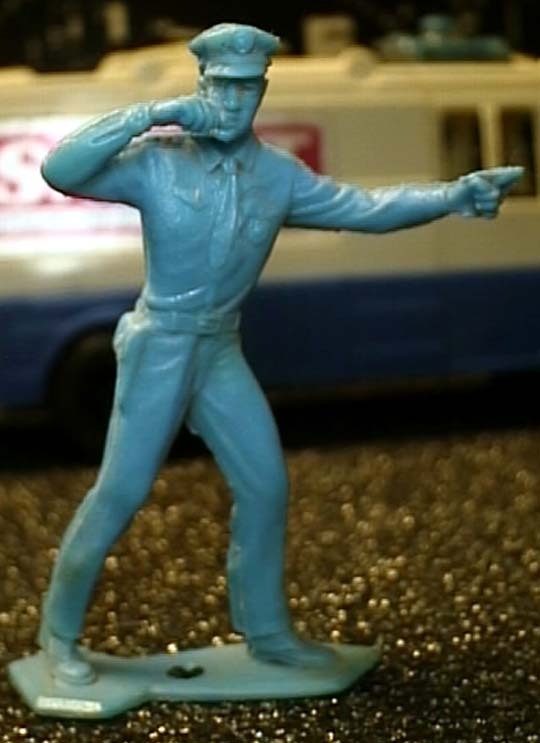 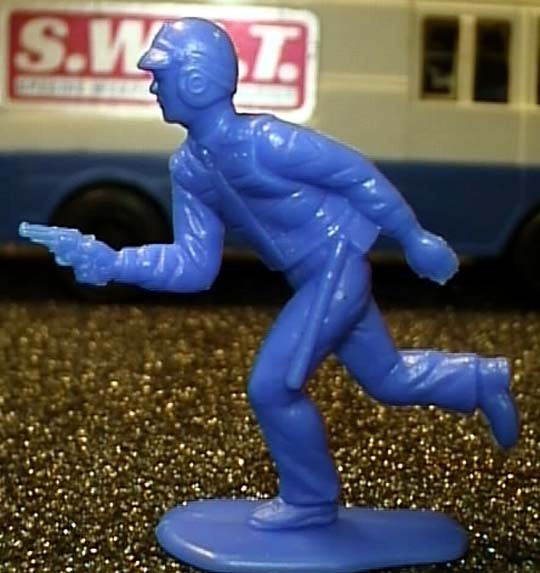 While we are talking about 60mm police figures...let's look at some of the older ones...Auburn Rubber and Gay Toys produced police figures that really compliment each other. 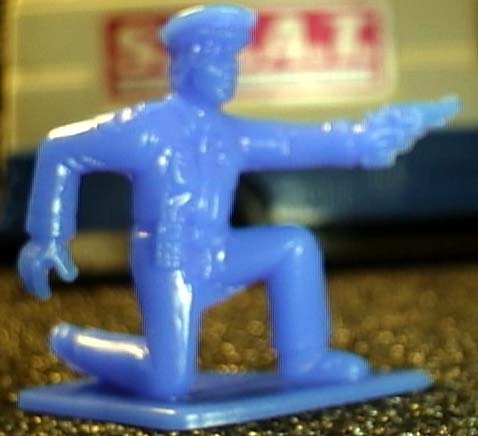 The Auburn cops were produced in a light blue and white(ugh!). 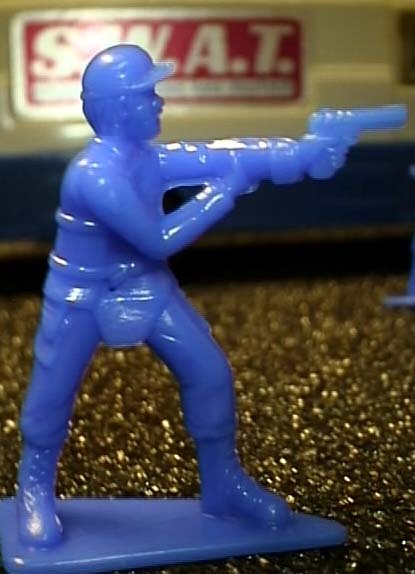 I have only seen the Gay Toys figures in blue. 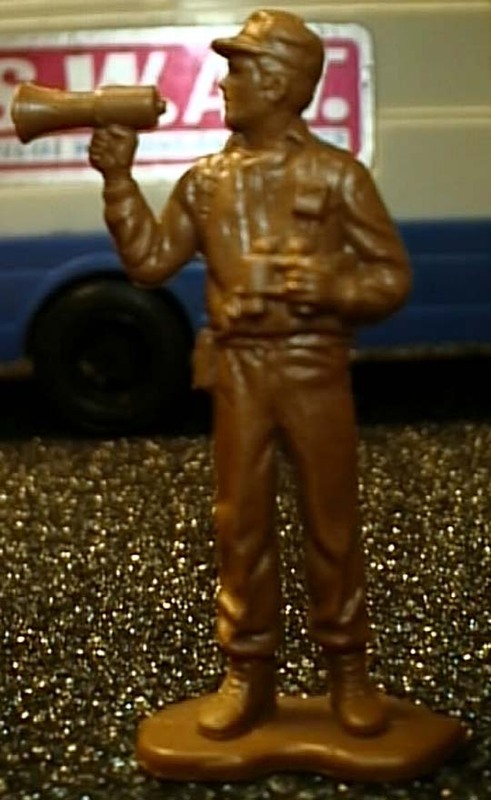 I got an odd email after bidding on a Gay Toys cop figure on Ebay once. 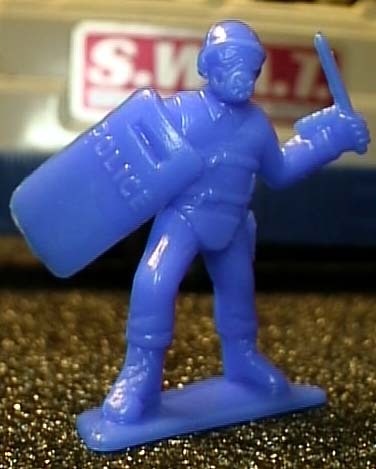 I didn't respond. 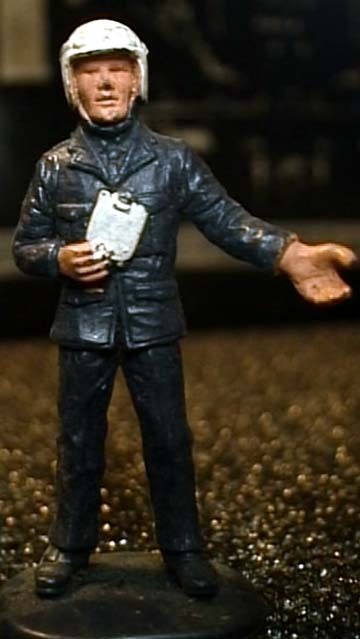 And finally, a Marx 54mm figure from the Cape Canaveral set, he may be a pilot, but unarmed and standing by watching...could be the chief of this little plastic PD...so here he is. 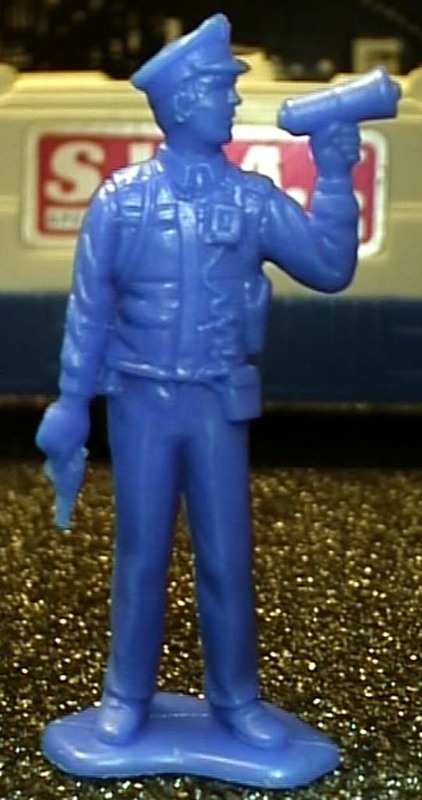 Dedicated to Law Enforcement worldwide...be safe out there.